Other details:In 1994 when I was strolling on the street, I saw “Readers’ Digest” published in 1992, from which I learned you were working for the Japanese claim. In 1938 my second elder brother and I joined Anti-Japanese activities. In 1940 my second elder brother was captured by the Japanese Army at home and killed at Taihu in Jiangsu. After I was captured I received severe torture, since there’s no evidence. It was after seven days that they agree to give me bail. I hope you to renew efforts to uphold justice for victims. Foreword: In lunar January 1994, I bought several old magazines in the street, including the Reader’s Digest published in October 1992. 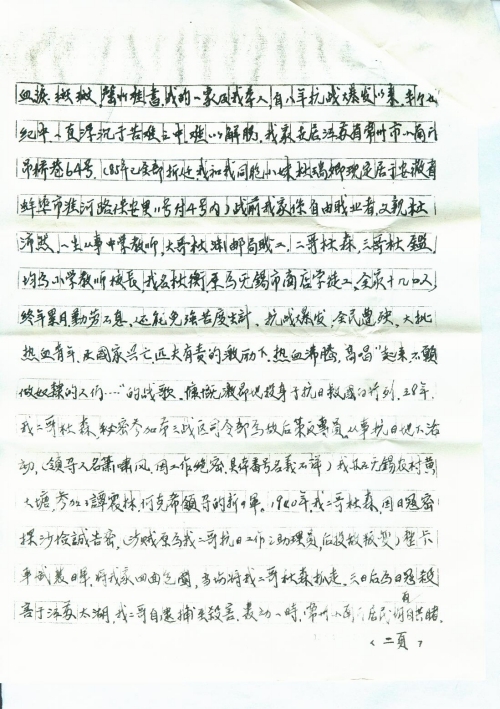 On its 46th page is an article entitled “History Is Not Forgotten: Records of the Chinese People Demanding Damage Compensation from Japan” by Mr. Li Peiyu, abstracted by Mr. Hong Bo from Jinhua Daily of June 30, 1992. I was filled with indignation after reading it. The article brought out my anger that has been buried in the heart for more than half a century. 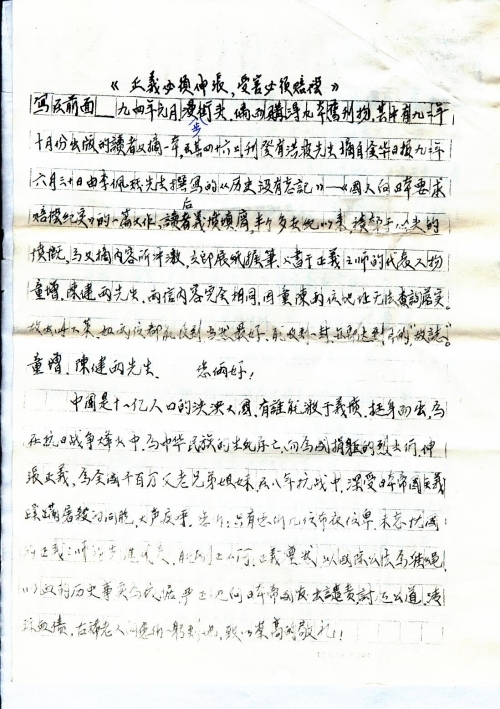 I decided to immediately write a letter to Mr. Tong Zeng and Mr. Chen Jian, the representatives of the army of justice. The letters sent to you are the same. I came up with this idea because I couldn’t find your addresses. It’ll be the best if both of you can receive my letter and it still serves the purpose if either of you receive it. China is a large country with a population of 1.1 billion. But only a few ordinary people like you are brave and responsible enough to stand up to pursue justice for the compatriots who sacrificed their lives for the survival of the Chinese nation and for the Chinese victims who were massacred in the 8-year Japanese war of aggression against China. As an old man, I’d like to send my highest regards to you for solemnly denouncing the Japanese imperialism, pursuing justice and demanding compensation from Japan by using international law as a weapon and the history as a basis. The suffering of my family and myself is too much too record. For half a century since the breakout of the 8-year War of Resistance Against Japanese Aggression, I have been haunted by suffering and cannot get rid of it. My family originally lived in No. 64, Diaoqiao Lane, Xiaonanmen, Changzhou City, Jiangsu Province (all demolished in 1985. Now my younger sister Du Ruiqing and I have settled down in No.11-4, Baoan Lane, Huaihe Road, Bengbu City, Anhui Province). Before the war, my family were freelancers. My father Du Peiran was a middle school teacher, my oldest brother Du Yuan was an employee at a post office, both my second oldest brother Du Sen and my third oldest brother Du Jian were a primary school teacher and principal, and I, Du Heng, was an apprentice at a store in Wuxi City. My whole family had over 10 members and we all worked hard to barely make ends meet. After the war broke out, all the people suffered and a large number of responsible young people stimulated by the sense of national duty, passionately devoted themselves to the anti-Japanese cause by singing the battle song of “Arise! We who refuse to be slaves…” In 1938, my second oldest brother Du Sen secretly joined the Command of the Third Theater as a spy and was engaged in underground anti-Japanese activities (His leader was Xiao Xiaofeng. I don’t know his specific army number due to the confidentiality of his work). I also joined the anti-Japanese army led by Tan Zhenlin and He Kexi in Huangdatang Village, Wuxi City. In 1940, after a secret Japanese spy Sha Jiancheng informed on my second oldest brother Du Sen, (Sha was a former assistant to my second oldest brother and later defected to the enemy), a full truck of armed Japanese soldiers surrounded our house and took away my second oldest brother. Three days later, he was killed by the Japanese in Lake Tai, Jiangsu. The arrest and killing of my second oldest brother was a sensational event and witnessed by the residents of Xiaonanmen, Changzhou. 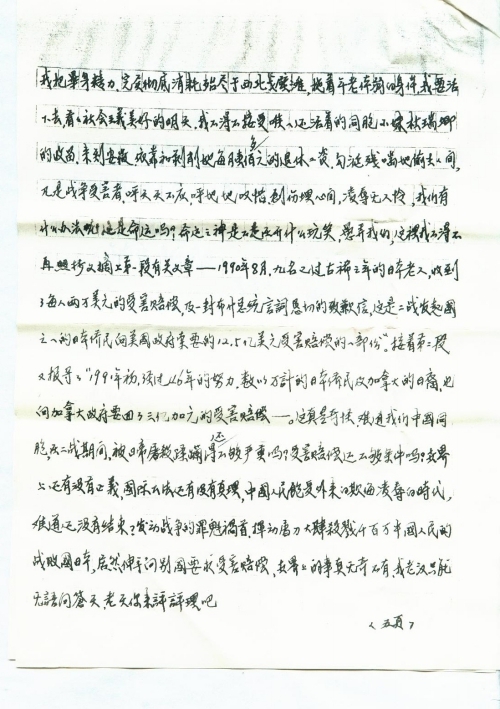 After Japan surrendered in 1945, Changzhou Zhongshan Daily and Changzhou Standard published “Biography of Martyr Du Sen” on the front page, which can be found in the magazine archive of 1946. After the People’s Liberation, he is recognized by the People’s Government as Anti-Japanese Soldier. When my second oldest brother was arrested by the Japanese soldiers, I was recuperating from injury at home. Before that, as the New Fourth Army retreated by order from southern Jiangsu to northern Jiangsu, I was transferred to study at No. 3 Yancheng Anti-Japanese Military and Political University in northern Jiangsu. 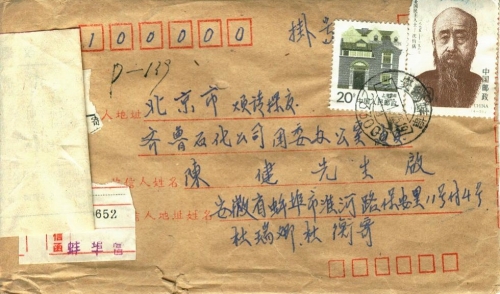 When I passed Dayangqiao at the railway station in Wuxi on my way to Yancheng, I was arrested by a secret Japanese spy and escorted to the base of the Japanese army in Saiqiaotou outside of the north gate of Wuxi, where I was brutally punished and interrogated. But as there was no witness or evidence, and I carried on me certificates such as Law-Abiding People Certificate that the organization offered me before my departure, the Japanese army agreed 7 days later that I was bailed out and went home for recuperation. So, when the Japanese soldiers came, I was hiding under the bed in our attic and survived. My second oldest brother was downstairs and captured on the spot. After the Japanese soldiers left, I immediately fled from home to the Xinan Middle School in Xiaxi Town, 36 huali (1 huali = 500 meters) from the city, where my father worked as a high school teacher. I told him how my second oldest brother was arrested. 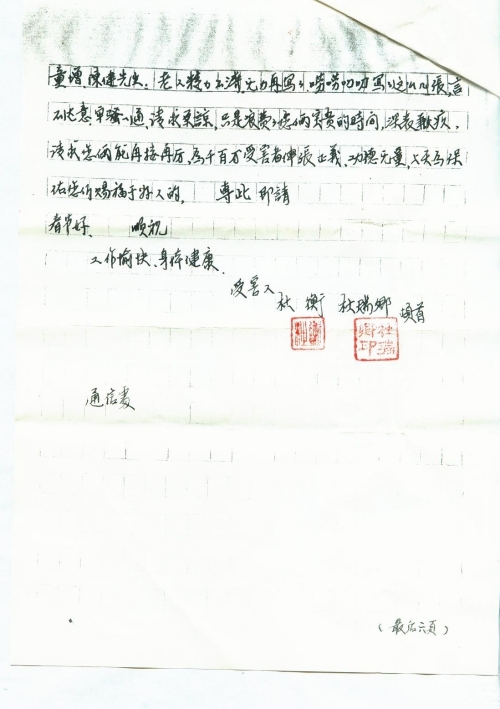 As it was not safe for me to hide in the school under that circumstance, after discussing with his colleagues, my father asked people to send me to the area under the jurisdiction of Chiang Kai-shek at that very night to prevent me from being harmed by the Japanese army. After that, I fell into the abyss of suffering. My second oldest brother was killed by the Japanese army, and his arrest and death also made me suffer as the old Chinese saying goes “When the city gate catches fire, the fish in the moat will suffer.” In 1952, when I was teaching in Shanghai, the Shanghai Military Control Commission arrested and sentenced me to death with a two-year reprieve with the charge of betraying the revolution, 22-month reaction and harboring criminals after the People’s Liberation. 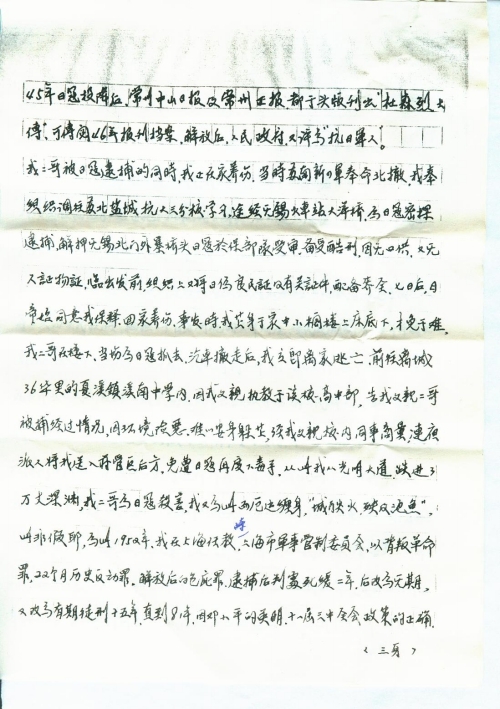 Afterwards, the sentence was changed to life imprisonment and then to fifteen years imprisonment. 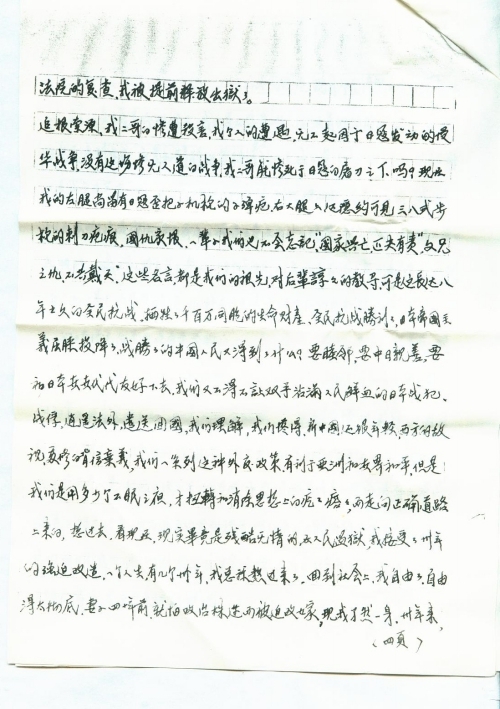 In 1981, I was released earlier from prison thanks to Deng Xiaoping’s wisdom, the correct policy of the Third Plenary Session of the Eleventh Central Committee of the Party and the review of the court. Fundamentally, both my second oldest brother’s death and my suffering are caused by Japan’s launch of the war of aggression against China. If not for the inhuman war, how could my second oldest brother be tragically killed by the Japanese soldiers? Even until today, my left leg still bears the scar of the bullet wound and my right thigh bears an indistinct scar of the bayonet wound caused by the type 38 rifle of the Japanese army. We will never forget the national and family hatred. Famous lines such as “The rise and fall of the nation is the concern of every citizen” and “The death of father and brother must be avenged” are what our ancestors earnestly teach the younger generations. But the 8-year war caused the losses of millions of lives and countless property. Although we won the war through the efforts of the whole nation and Japan surrendered, what do the winning Chinese people get? To enable friendly diplomatic relations and a Sino-Japanese friendship for generations to come, we have to send Japanese war prisoners and criminals back home. We understand that the new China is young and faces hostility from the western countries, so we shall implement diplomatic policies with Japan that are beneficial to the peace of Asia and the world. But how many sleepless nights have we had to remove our unwillingness and walk on the correct path? After all, reality is cruel and ruthless. I spent 30 years in prison where I was forced to change myself for the better. How many 30 years do we have in a lifetime? Finally, my suffering is over and I return to the society as a free man. But I am too free. My wife was forced to remarry 40 years ago for fear of being implicated politically. Now, I am a single man. For 30 years, I fully devoted my energy to the northwest Gobi Desert and now I have to live as a weak, old man to see the better tomorrow of socialism. I have to accept the shelter of my only alive younger sister Du Ruiqing. I’ve come to Anhui to exploit her retirement salary of over RMB 100 per month. As a victim of the war, I struggle to live with trauma and humiliation in my heart. What choice do we have? It must be the God of Fate making a fool of us. Here, I have to copy the first paragraph of the article from the Reader’s Digest, “In August 1990, 9 Japanese people, each aged over 70, received a damage compensation of USD 20,000 per person and a sincere apology letter from President Bush. This compensation is part of the USD 1.25-billion damage compensation that residents of the United States from Japan, one of the countries that launched the World War II, demanded from the American government.” Then, the second paragraph continued as follows, “In early 1991, after 46 years’ efforts, thousands of overseas Japanese and Japanese Canadians received damage compensation of 300 million Canadian dollars from the Canadian government.” How strange is that! Didn’t we Chinese compatriots suffer enough from the Japanese army during the World War II? Aren’t we eligible for damage compensation? Is there justice is the world? Whose needs does the international law really serve? Does the era when the Chinese people are bullied by the foreigners not end? The defeated Japan that launched the war and massacred millions of Chinese people actually asked for damage compensation from other countries! The world is really full of wonders. I am speechless. God, please be the judge. Mr. Tong Zeng and Mr. Chen Jian, I’ll stop here. Please forgive me for my poor expression and complaining. I apologize for wasting your valuable time. I hope you two will continue to pursue justice for millions of victims. God bless kind people like you. Wish you happy Spring Festival. Wish you healthy and success with your work.